Crying out for mercy. On earth there was none. Today in our reading we will be looking at one of my favorite stories. Not THE favorite, but up there among them. The story is about a self-absorbed rich man and a destitute beggar. This story is also where we get a glimpse at God’s “holding place” for those who believed in and followed Him before Jesus’ final sacrifice. Let’s see where He takes us today. We start our story out with a quick peek at both our main characters. We are not told a lot about these men, but we can make some very accurate assumptions from what we are given. The rich man had the best of everything. Fine clothes, plenty of food, and had a fine house. He was also stingy, cared only for himself and was hard hearted. Every day Lazarus was laid at his gate. EVERY DAY! How many times had he walked right past him? How many times had he seen his sores or watched out a window as the dogs licked him? How many times had he turned a deaf ear to Lazarus’ plea for a crust of bread or a single coin? 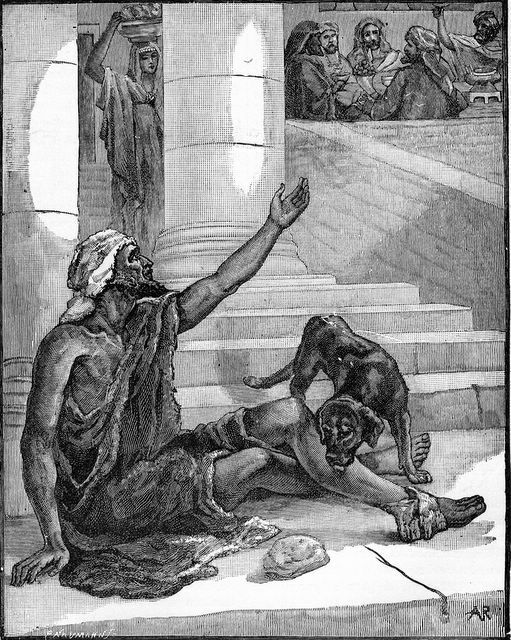 Each and every time, he turned away, treating Lazarus as nothing. He had MORE than enough to share. Even if he simply shared his trash, Lazarus would have been better off. But he did NOTHING in his life to help this man he saw every day. We also know a little about Lazarus. He was so sick he could not even walk. He was carried to the gate by someone every day. He was covered in sores and very weak. He didn’t even have the strength to chase the dogs away from him. I wonder if their licking his sores hastened Lazarus’ death. I wonder if he was longing for his death before it finally came. Why was he brought here repeatedly when he received nothing? Did others who passed by this gate give to this poor beggar? Did he actively ask for alms? Something else we know about these two men is where they were spiritually. The rich man knew of Abraham, Moses and the prophets but he ignored their teachings. He was an unrepentant sinful man. He didn’t need God because he had money. Money was his god. Whereas Lazarus loved God and served Him the best he could. He trusted God with His life. How do we know this you ask? Because of where each of them eventually ended up. Lazarus was in Abraham’s Bosom and the rich man was in Hades. You don’t get to these destinations by accident. You make one or the other of these places your home by the choice you made in life. Choose God, choose life. Refuse God, refuse life. It’s that simple. After death, the rich man finally thought of others. Not at first. In the beginning of his conversation with Abraham he asked for help for himself. Talk about reaping what you sow! But by the end of his conversation, he was thinking of his brothers. He didn’t want them to suffer the same fate as him. This makes it sound as if his brothers knew Lazarus too while he was alive. ALL six of them ignored Lazarus’ condition. All six of them were unrepentant men. While I was reading this story the next section got my attention. The last exchange between Abraham and the man could be a direct prophecy for Israel’s religious leaders. “But Abraham said ‘They have Moses and the Prophets; let them hear them.’ And he said, ‘No, father Abraham, but if someone goes to them from the dead, they will repent.’ He said to him, ‘If they do not hear Moses and the Prophets, neither will they be convinced if someone should rise from the dead’” (verses 29-31). This is exactly what has, and still is happening, with Israel’s religious leaders. They had Moses and the Prophets walking with them daily. They refused to hear their instructions from God. They fought at every opportunity. Then Jesus comes on the scene. Jesus is fulfilling prophecy right before their eyes, yet they refuse to see. Then Jesus comes back to them from the dead! STILL, they refuse to believe. Unfortunately they are, or are going to be, sharing a “cell” with our rich man. There is only one way out of this disastrous end; repent and receive the free gift of salvation Jesus bought for you. It’s free for you and me because He willingly paid the price for each of us. Father God, I’m sorry that they still don’t believe in the work Jesus did on the cross. To be blind for so long and they have been passing on that blindness to their children. I can’t understand how they can be so blind! Just like the rich man that walked by Lazarus, they had Jesus walking right down their streets. Yet they refused to see Him for who He truly is. There will come a day when EVERY knee shall bow and EVERY tongue confesses the truth; Jesus is Lord! Thank You for showing me that truth now instead of it being wrenched from my lips on that day. I pray my children and grandchildren make that decision in time too. Thank You for letting me plant seeds again today. I am really loving the theme/design of your web site. Do you ever run into any web browser compatibility problems? A handful of my blog readers have complained about my site not working correctly in Explorer but looks great in Firefox. Do you have any ideas to help fix this issue? Thank you for visiting my site. It just so happens that I was notified about a compatibility issue in Opera today. I don’t have any idea how to go about addressing this kind of problem, but thankfully I don’t have to fix it. My site is hosted by a very experienced hosting company and they deal with all these issues for me. I use Accelerated Web Solutions and their tech assistance is amazing. If you are interested in learning about them, click on the link on the right that looks like a little monster. Thank you for your encouraging words and I wish you every success in your blogging.